We have an abundance of salad greens and tomatoes from the garden right now…this is a quick and easy lunch. Store the dressing in a squirt bottle – it keeps very well. 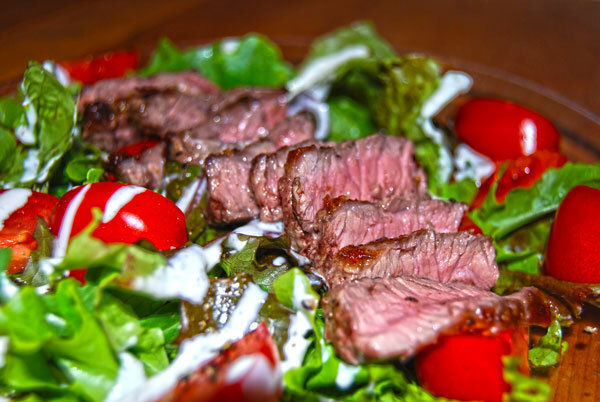 Steak Salad with Garlic Ranch dressing. Combine first 8 ingredients to make the dressing. Add more buttermilk if you like it a little thinner. Pan fry steak to desired done-ness seasoning with salt, pepper, and garlic powder. Let stand before slicing. Assemble salad and dig in ! Thanks! It’s the fastest lunch imaginable if you have the dressing pre-made.